2016 08 12 Guilford CT Surf Club – Double Vision – San Diego Surfing Academy – San Diego Surfing Academy Since 1995! OCEANSIDE HARBOR LIFEGUARD TOWER TEN, NORTH COUNTY COASTAL SAN DIEGO — August 12, 2016 – School is out for the Spaulding Twins so there was only one thing to do. 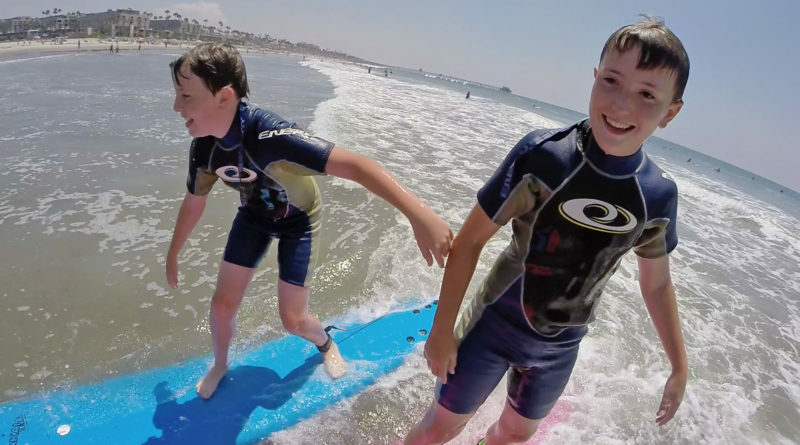 Hop a flight out of Guilford, CT, check in with Grandpa and Grandpa Chaplin and then check out Oceanside Harbor with Coach Pat Weber of the San Diego Surfing Academy (a real cool school). Here comes double trouble, meet Cole and Evan!